We checked our website and it's clean! No Trojans! The problem here is with your AVG software! You should contact AVG Support. Please contact us directly if you have any problems with our website in the future and we will solve the problem as soon as possible! found the same thing when i googled...avg problem !!! my apologies for raising doubts !!! Looks well designed. Thanks for the free plans. I can't quite imagine how the canopy opens though. It looks like it hinges and is held in place with a skewer. Could you describe how it works or snap a picture? I am looking forward to making this one. No problem! We've found a solution for this mystery! You have part number 2 (the CANOPY MOUNT SUPPORT) in a quanitity of 2. One is glued under the canopy at the front and the other in the fuselage as shown in the picture. The BBQ skewer prevents the canopy from lifting. You can also glue two magnets instead of the BBQ skewer. That makes sense. Very clever design. Thanks for the response. Is there by chance going to be a build video or a build article or anything with this? I can build a FT plane usually with minimal video help but after reviewing your plans it looks a tad difficult. Those inner spars look super tiny. Are they just thin strips of foam? The 2 pages in the plans titled AP_Eazy_Full.pdf, are they each the size of one sheet of foam? This is version 0.1 of the build plan and the plane is still in the BETA stage. I don't plan to make a video about the assembly, but I could make a photo series for version 1.0. After all, it's an entry-level model and should get a guidance. I have labeled the areas in the build plan and marked them with green dash dot lines where the spars are to be glued. Yes, the inner spars are only the four thin foam strips. Between the front and the rear inner spar, the servo cables should still be pushed through. With the next version (0.2 or 1.0) there will be only one inner (center) spar, which corresponds to the outer spars except for its length. This strengthens the wing. 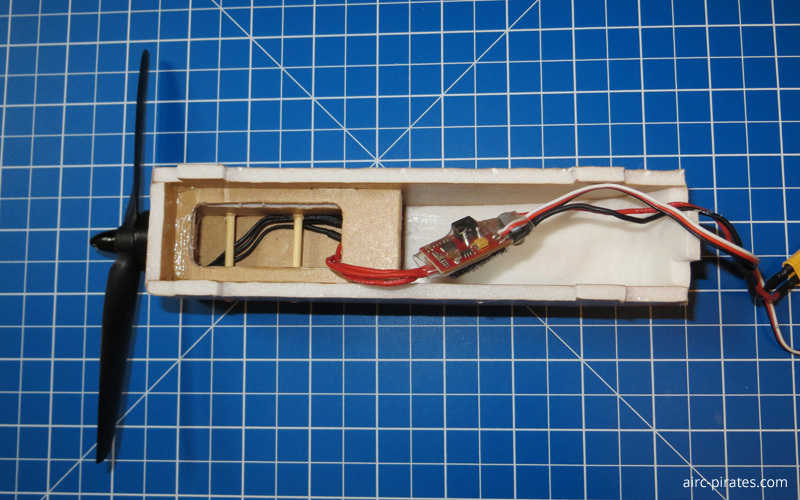 The servo cables can also be pushed through the wing behind this spar. However, the opening for the servo cables contained in the wing must be slightly further back. 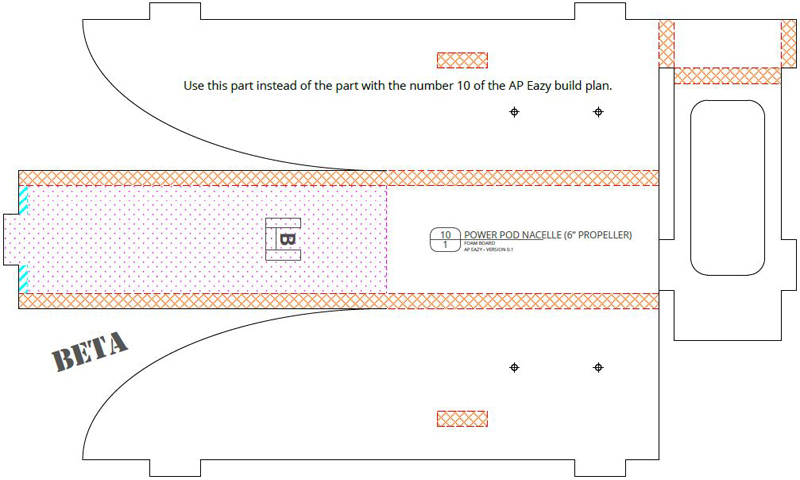 … The 2 pages in the plans titled AP_Eazy_Full.pdf, are they each the size of one sheet of foam? The page itself has not the size of one sheet of foamboard, but the area in the page with the parts has the size of one sheet of foamboard. I always print the parts from the file titled AP_Eazy_Full.pdf. I use the snapshot and poster print function of Adobe Reader to print the part templates. Have fun and if you have another question, don't hesitate to ask it. Inspired by Grifflyers awesome Grunjet I am about to replace the Power Pod Nacelle with an EDF tube (50mm). But that's something for the Mad (Scratch) Builder's Corner! I will call it the Eazy Ducted Fan! The AUW with a 3s 1000mAh battery is at 400g (14.11 oz). I used the HK 50mm Alloy EDF 4800kv (3s version) unit. It has the least thrust. When I have finished the plan, there will be an own thread in the Mad (Scratch) Builder's Corner! Oh my does that look great!! After looking closer at the plans I see how it goes together for the most part. I had the plans printed at the office store by my house. Will be building next week for sure. I'll post finished pictures here. I may have to modify in the future to do that sweet edf version tho. Looks nice. Thanks for the quick responses. 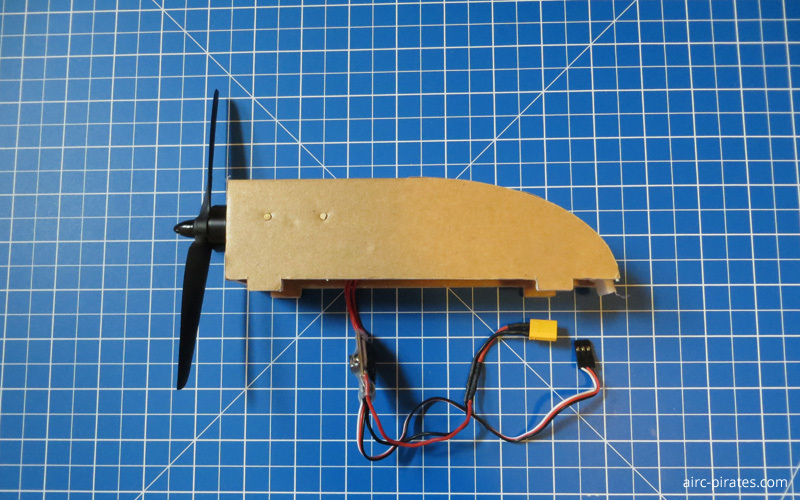 The maiden flight of the Eazy Ducted Fan was successfully completed! More here!! Now part #15 is only one inner (center) spar, which corresponds to the outer spars except for its length. This strengthens the wing. 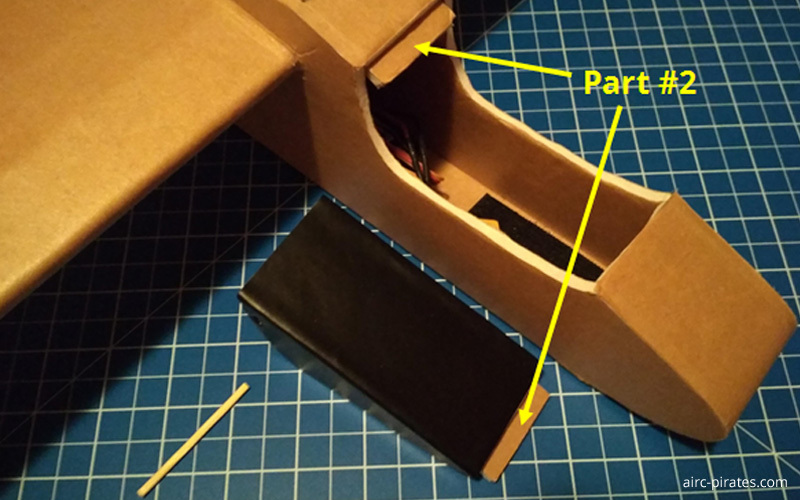 The servo cables can also be pushed through the wing behind this spar. Due to the amendment to Part #15 the opening for the servo cables at parts #12 & 13 contained in the wing is now slightly further back. Can a 6" prop fit? or could it be easily modified to fit a 6" prop? The Eazy is only designed for 5" propellers. If you extend the Power Pod Nacelle (Part #10) in height, then also a 6" propeller fits. This is the easiest way to use a 6" propeller. Ok. I think i will try modifying the nacelle to fit 6" props. I have many extra laying around. I will post my results from this modification once I am done with construction and have flown the aircraft. I am excited to see how this flies. Got mine built. Waiting on the weather to maiden tho. I did modify mine a tad. I added an arrow shaft to the wing. I took out the two small spars in the middle of the wing, the two closer to the leading edge, and i cut about 1/4 inch off of the outerspars to have room for the arrow shaft. 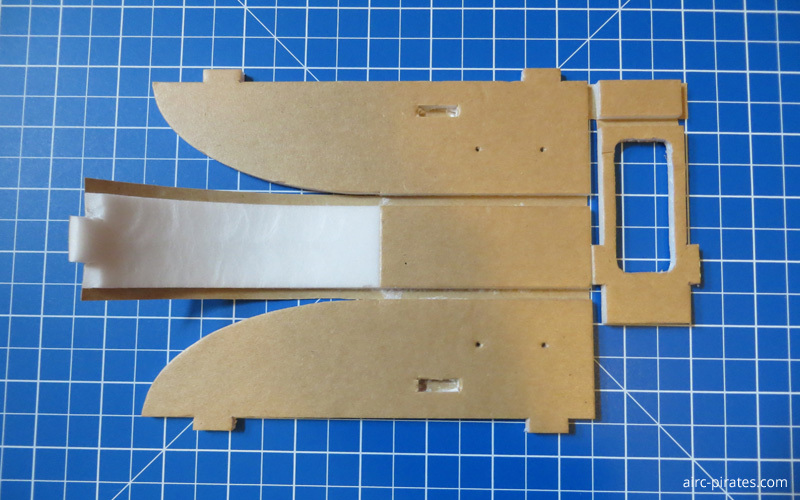 I also cut the tabs off of the servos so they could fit. Worked out very nicely. The wing is SUPER rigid. 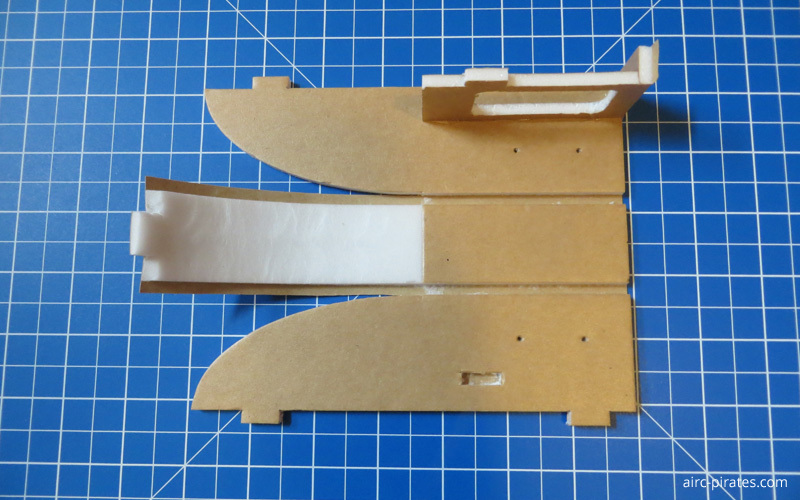 I also added a BBQ skewer on the horizontal stabilizer to keep it from bending or warping. I had trouble with single layer foam on my tails on other planes bending and warping so i always support them now. Other than that, i'm running a DYS Samguk Series Wu 2206 2400KV motor on a 5x4x4 prop and plan to maiden on 3s when weather permits and move to 4s shortly there after. I'm pretty sure this thing will be a rocket. More pictures of pirate decals and updates after maiden. Thanks for the awesome plans!!! Thank you for sharing a picture and the details of your Eazy. I'm looking forward to the pirate decals and the updates after the maiden flight! For Steven.nelson196 and everyone who wants to use a 6" propeller, I created an alternative Power Pod Nacelle.